“Yellow lantern chili” redirects here. For the Chinese chili, see Hainan yellow lantern chili. Capsicum chinense, commonly known as the “bonnet pepper” is a species of chili pepper native to the Americas. C. chinense varieties are well known for their unique flavors and many have exceptional heat. The hottest peppers in the world are members of this species, with Scoville Heat Unit scores of over 1.5 million. Some taxonomists consider them to be part of the species C. annuum, and they are a member of the C. annuum complex. C. annuum and C. chinense pepper plants can generally be identified by the number of flowers or fruit per node, however—one for C. annuum and two to five for C. chinense, though this method is not always correct. The two species can also hybridize and generate inter-specific hybrids. It is believed that C. frutescens is the ancestor to the C. chinense species. Despite its name, C. chinense or “Chinese capsicum” is misleading. All Capsicum species originated in the New World. Nikolaus Joseph von Jacquin (1727–1817), a Dutch botanist, erroneously named the species in 1776, because he believed they originated in China due to their prevalence in Chinese cuisine after their introduction by European explorers. Within C. chinense, the appearance and characteristics of the plants can vary greatly. 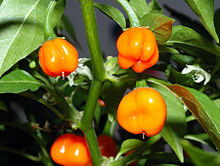 Varieties such as the well-known Habanero grow to form small, compact perennial bushes about 0.5 metres (1 ft 8 in) in height. The flowers, as with most Capsicum species, are small and white with five petals. When it forms, the fruit varies greatly in color and shape, with red, orange, and yellow being the most common mature colors, but colors such as brown and purple are also known. Another similarity with other species would be shallow roots, which are very common. C. chinense is native to Central America, the Yucatan region, and the Caribbean islands. The term Habanero, meaning from Habana (Havana, Cuba), comes from the fact that several peppers of this species were exported out from this port in its native range. In warm climates such as these, it is a perennial and can last for several years, but in cooler climates, C. chinense does not usually survive the winter. It will readily germinate from the previous year’s seed in the following growing season, however. Seeds of C. chinense have been found in cave dwellings in Central America that indicate the natives have been consuming peppers since 7,000 BCE. In Eastern Mexico, dry pepper fruits and seeds have been recovered from 9,000 years old burials in Tamaulipas and Tehuacán, further indicating their use since 7,000 BCE. Domestication might have taken place 10,000 to 12,000 years ago in Central–East Mexico. C. chinense peppers have been cultivated for thousands of years in their native regions, but have only been available in areas of Asia and Africa for about 400–500 years following the Columbian Exchange. Selection in the new environments have led to the rise of new varieties that are bred and farmed in Asia and Africa. C. chinense are also popular with many gardeners for their bright colors (ornamental value) and for their fruit. C. chinense and its varieties have been used for millennia in Yucatan and Caribbean-style cooking to add a significant amount of heat to their traditional food. They are mainly used in stews and sauces, as well as marinades for meats and chicken. Western food at times also uses some of these chiles. For example, Habanero (a group of C. chinense varieties) are commonly used in hot sauces and extra-spicy salsas, due to the popularity of Tex-Mex and Mexican cuisines in Western culture. ^ “Capsicum chinense Jacq”. The Plant List. ^ “Hottest chili”. Guinness World Records. Retrieved 2016-02-02. ^ Eshbaugh, W.H (1993). “History and exploitation of a serendipitous new crop discovery”. In Janick, J; Simon, J.E. New crops. New York: Wiley. pp. 132–39. ^ Tanksley, Steven D; Iglesias-Olivas, Jaime (Nov 1984), “Inheritance and transfer of multiple-flower character from Capsicum chinense into Capsicum annuum”, Euphytica, 33 (3): 769–77, doi:10.1007/bf00021903 . ^ Russo, Vincent M. (2012). Peppers: Botany, Production and Uses. Centre for Agriculture and Bioscience International. p. 17. ISBN 9781845937676. Retrieved 17 May 2017. ^ Andrews, Jean (1995). “Historical Background”. Peppers: the Domesticated Capsicums. Austin, TX, USA: University of Texas Press. pp. 1–10. ^ a b Bosland, P.W (1996), “Capsicums: Innovative uses of an ancient crop”, in Janick, J, Progress in new crops, Arlington, VA: ASHS Press, pp. 479–87 . ^ “Chinense Species”. Capsicum Species. The Chilli Man. Archived from the original on 23 February 2012. Retrieved 8 May 2011. ^ Smith, P. G (1950-05-01). “Inheritance of brown and green mature fruit color in peppers”. The Journal of Heredity. 41 (5): 138–40. ISSN 0022-1503. PMID 15436970. ^ a b “Peppers”. Plant sciences. UC Davis. Retrieved 2016-02-02. ^ a b “Chili Peppers First Cultivated in Mexico”. Gary Nabhan. Archived from the original on 2014-09-08. Retrieved 2016-02-02. ^ Webster, Valerie. “Habanero Hot Sauce – Cure for Common Cuisine”. Recipes. Caribbean Choice. Retrieved 7 May 2011. ^ “Mexican American culture”. Kwintessential Publications. UK. Retrieved 7 May 2011. Capsicum chinense in West African plants – A Photo Guide.